Two decades ago, my husband walked in the door from work with a broad grin, announcing he’d gotten a promotion and handing me two glossy home sale magazines. I was home on maternity leave with our newborn and a 2-year-old and I joined right in with his excitement. This was a great move to a great town and offered what we thought was a world of possibilities to our little twenty-something selves. Other changes aren’t so easy. Deep down we know they’ll be good for us, but we first have to make it through the hard. That’s where I was a decade ago, when Dan received another call. It was his dream job and while he was elated, I was conflicted. It meant pulling up the deep roots we’d sunk into this town where I could have happily stayed. “Give it time,” I told myself through the house hunting and church finding. Sure enough, after about a year, we began to settle into a new neighborhood, a new circle of friends and a new church. But life can also dish out unwanted change. The kind that no amount of time will fix. We’re not talking a new job or new neighborhood. This is change that forever shatters life as you know it. That’s the kind of change I faced four years ago when I woke to the sound of Dan’s labored breathing. He was having a heart attack, and three hours later, I came home to tell our children the doctors had been unable to revive him. Change I could never have imagined, never have prepared for, rushed in and crippled every part of life. What do we do with this kind of change? Every morning, alone in my minivan, I poured my heart out to God. “I CANNOT DO THIS” I would write at the top of my journal. I had no idea what my future looked like and no amount of chin-up would bring my children’s dad back. I may not be able to embrace this kind of change, but I have to accept it or I might as well write off every bit of joy and hope God still has for us. 1. We may not know our future, but God is already there. He goes before us, yes. But it’s not that God stays just one step ahead of us. 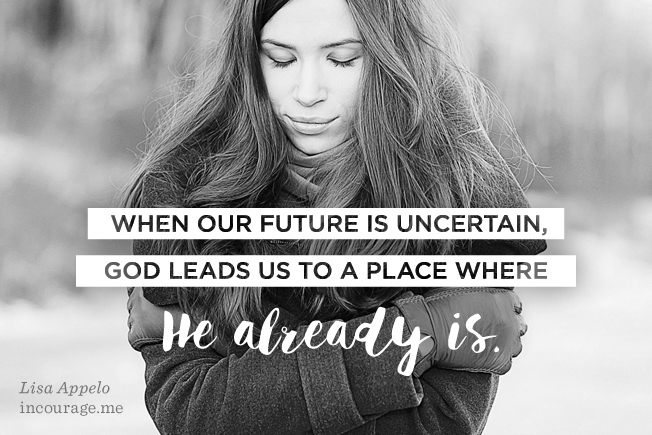 When our future is uncertain, God leads us to a place where He already is. That is peace-giving truth. There will be joy and laughter and good there just as much as God has brought joy and laughter and good to the chapters we’ve already lived. 2. God is more interested in the process than the destination. We want to know where we’ll land. We crave that security. Will we be okay? Will God take care of us? Yes, God will take care of us, but He is less concerned about our comfort and more concerned about our conforming. We may not know where we’ll land, when we will be healed or what the finances will look like. But regardless of that destination, God can use the process of getting there to make us more like His Son if we will let Him. 3. Unwelcome change allows us to utterly depend on God. This is precisely where God wants us. We can grieve at what got us here, but being in a place of utter dependence on God is a good place to be. It’s where we can see God so clearly and hear Him so distinctly. We may not be able to change our circumstance, but we can change what we see in the circumstance. We will forever have a hole in our hearts. This kind of change is as hard as it gets and yet — we can accept it. When change comes that we cannot wrap our arms around, we can trust the God who’s allowed it. And in the process, we can choose to see all that God has for us in it. **This post first appeared as a guest post at (in)courage. If you’d like encouragement in your inbox, subscribe to emails here and I’ll send my FREE 100 Days with Christ Bible study & journal. Sometime after Dan died, I knew that I’d need to start working again, probably on a very part-time basis and ramping up as my youngers grew. In the days before I had 7 kids, I was an attorney – a litigator and I loved it. After Ben was born, I pitched a part-time proposal to my firm. They said yes and I cut back to billing only 30 hours a week. When my third was born, I cut back even more, dropping my benefits and working on a contract basis. That was perfect and I thought I would keep doing that until my kids were grown and launched. Then I had child #4. 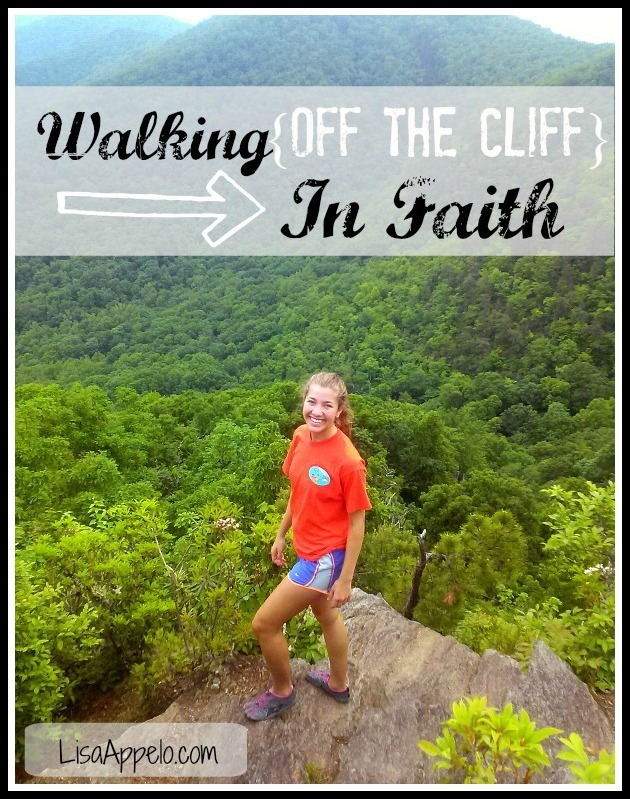 At that point, life was crazy with preschool and a nanny and four little children and Dan and I decided to take a huge leap of faith. I stopped working altogether. We cut every single expense to the bone; we pulled kids out of preschool, stopped using the dryer, learned to give haircuts and didn’t just shop sales – we shopped garage sales. In those years, we cut our teeth on trusting God with our finances. God always provided.